Lyon is France’s third largest city and gastronomic capital. Four hours by train from Nice, we travelled in first class for just an extra 2 Euro – a special that SNCF had for the 7.25am train. Ah, first class. Love that. We stayed at the Grand Hotel Boscolo, a four star hotel situated between the Rhône and the Saône rivers, a short walk to the old town and a few steps away from the main shopping precinct. We got a ‘value deal’ from Booking.com and paid 262 Euro for two nights, about A$385 – which was good value. The hotel was comfortable enough, but quite dated. After we showered, we discovered that our toilet leaked quite badly. The smell was not pleasant, as you can imagine. Lucky for us, we were moved and upgraded to a suite that didn’t have a toilet that leaked – a much bigger and nicer room. 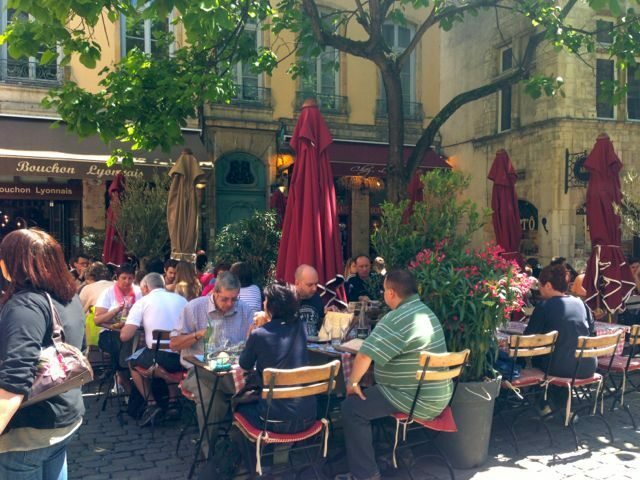 Being the gastromonic capital of France, I had read that the bistros in Lyon, known as bouchons, were not all created equal. Like in Nice, care must be taken when choosing where to eat. The old town has several great paved streets filled with cafes, bouchons and brassieres spilling out onto the pavement. Locals and visitors packed these places enjoying an al fresco lunch. Zorba, who is now becoming a bit of a master and finding great places to eat, kept us walking – turning down one lane way after another, past many appealing looking cafes. When we were out of the thick of the old town epicentre, he stopped, in front of Les Fines Gueules. There was one free table for two out the front, recently vacated by the previous diners. The rest of the tables were packed and I could hear a lot of French being spoken by the seated patrons. Casting my eye on the door, I saw accreditation sticker from Only Lyon, the city’s tourism body, French Gastronomie Assoc, Michelin Guide, and an award of excellence from Trip Advisor. We took a seat. We decided to dive straight into mains to save an appetite for dinner. Our general rule is to only eat one meal out per day to try and save our waistlines (our first trip to Italy in 2010, Zorba put on 9kg in 7 weeks, and me 4kg. Not doing that again). 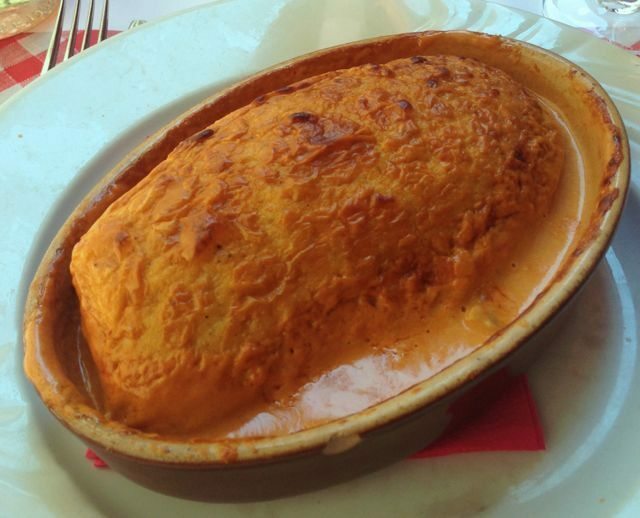 I had to try the Lyonaisse speciality quenelle, a light whipped flour, egg and cream dumpling – much like a giant gnocchi. It is sometimes whipped with fish, and almost always served with a shell fish bisque sauce with mushrooms. It was very tasty, the sauce was made with crab and mushroom, and the quenelle itself was soft and light. 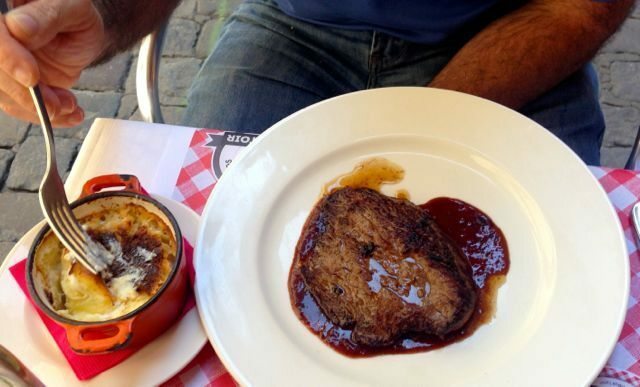 Zorba had sirloin steak with potato dauphinoise – his steak was cooked beautifully and perfect medium rare. The demi-glaze was rich, and the potatoes were to die for. The best ‘potato bake’ I’ve ever had. Given the food was good, we, or, decided we had to have dessert – the chocolate fondant was too tempting to resist. It was crisp on the outside and gooey and chocolately inside. Perfect. Our total bill came to 56 euro, for two mains, one dessert, wine and water. Our waiter Joël said confirmed what I had read and said that in the old town, about 80 per cent of bouchons bring in their food that is prepared in factories and that dishes are not made in house or on site. He then gave us several recommendations of places to eat during our stay in Lyon.